A showcase of Africa's rising automotive industry and vehicle makers. The Shaka Nynya, Shaka named after the founder of the Zulu nation, Chaka. Nynya is an anglicized Zulu word meaning Prowler. 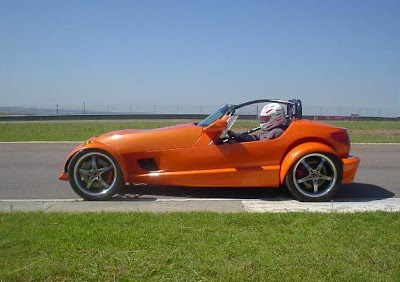 The Shaka design drew inspiration from many sources including the Plymouth prowler and Lotus 7. It can be said that the Shaka is to a Lotus 7, as a Viper is to a AC Cobra. The 'floating fenders' came from Bertone's "Toy Car". There is a bit of Ferrari, Lamborghini, Viper etc. thrown in for good measure. The performance criteria was to out-perform any production car in any performance category up to 135 mph. The Shaka was designed to beat any production car in any Autocross. Weight and chassis rigidity was of primary importance. This determined the final dimensions of the Shaka. An all aluminum 6 Liter, 405 HP engine is used with a 6 speed transmission. The Shaka is designed for the consummate road racing enthusiast. Drive to the events listed below and bring home the winner's trophy. A very stiff chassis allows for soft springs and a comfortable ride, unlike replica cars of the 60's. Tanzania Automotive Technology Centre (TATC). Established with an idea of creating a Centre of excellence in Tanzania to advance technology innovations, with the ultimate aim of attaining self reliance in technology relevant to the economic and social well-being of our country. nitiating the idea of a Kenyan car in 1986, former President Daniel arap Moi asked the University of Nairobi to produce a vehicle, 'however ugly or slow it may be'. The cars were not ugly. They were not very slow. During the test runs, the cars could attain a speed of 120 km per hour, according to a project engineer who used to drive the cars along Mombasa Road to as far as Sultan Hamud. These first ever Kenyan made cars - The Pioneer Nyayo Cars - now parked and gleaming clean at the Kenya Railways grounds - were, according to Mr Mogere, manufactured from locally available raw materials, resources and expertise. The car parts were either produced at military bases or at the Kenya Railways Central Workshops. And in 1990, President Moi launched three new Nyayo cars at the Kasarani Sports Complex. Automotive manufacture is a serious goal heating up in the East Africa region. Uganda comes in with an answer to Africa's private mobility needs after an earlier achievement of a full electric vehicle namely the Kiira EV prototype. This time they created a proof of concept for a production vehicle with a Hybrid powertrain to match called the Kiira EV Smack. "East Africa’s first hybrid electronic car has gone on display in Kenya ahead of its production in 2018. The Ugandan-made Kiira EV smack will be launched in Nairobi later on Friday as the manufacturers seek potential investors willing to fund their dream. Kiira Motors Corporation, the manufacturer of the vehicle, is looking for $300 million to enable them begin production. The hybrid electronic vehicle was conceptualised and made in Uganda, and now is seeking for potential investors across the East African region. Jonathan Kasumba, An automotive designer consulting on different vehicle projects. Founder of the Africa Automotive Design Association.